AgrAbility consists of the National AgrAbility Project (NAP) and State/Regional AgrAbility Projects (SRAPs). Both the NAP and all the SRAPs must be partnerships between a land grant university and at least one nonprofit disability organization. All AgrAbility Projects report to the USDA Cooperative State Research, Education, and Extension Service in Washington, D.C.
AgrAbility came into existence through the 1990 Farm Bill, and the first eight SRAPs were funded in 1991. At that time, the NAP was led by Purdue University's Breaking New Ground Resource Center in partnership with Easter Seals (national office). Funding continued to grow, and by 2000, 18 SRAPs were funded. At that time, leadership for the NAP moved to the University of Wisconsin-Madison in continued partnership with Easter Seals. Currently, there are 21 USDA-funded SRAPs providing services in 22 states, plus several unfunded affiliates serving other states via other funding sources. The NAP moved back to Purdue University in 2008, with partnering organizations being Goodwill Industries International, the Arthritis Foundation-Indiana Chapter, and the University of Illinois Urbana-Champaign. As of 2016, the NAP partners include Purdue University's Breaking New Ground Resource Center, Goodwill of the Finger Lakes, APRIL (the Association of Programs for Rural Independent Living), and Colorado State University. Prior to AgrAbility, several states had programs that assisted agricultural workers with disabilities, including Indiana (Breaking New Ground), Vermont, and Iowa. Review the summary, prepared by Breaking New Ground, of the first 25 years of AgrAbility. Click here to learn more about the NAP’s “Special Populations” outreach and accomplishments. If you are an agricultural worker needing assistance, use the contact list see if your state has an AgrAbility Project. If not, please contact the NAP. AgrAbility Projects generally do not provide direct funding to agricultural workers for adaptive equipment and other goods or services. Instead, such funding is often provided by state departments of vocational rehabilitation services (VR). For more information about VR, see the VR resource page. 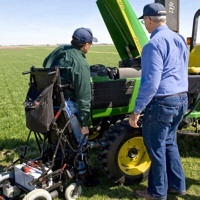 For information on starting an AgrAbility Project in your state, view the most recent Request for Applications (RFA) that describes what is required to submit an application for a new AgrAbility Project. The next RFA for state AgrAbility Projects is anticipated in spring 2018. The RFA for the National AgrAbility Project is anticipated in spring 2020.